Potassium nitrate is a colorless rhombohedral or trigonal solid, KNO3, soluble in water and decomposes at 400C. It occurs naturally as nitre and may be prepared by the reaction of sodium nitrate with potassium chloride followed by fractional crystallization. It is a powerful oxidizing agent (releases oxygen on heating) and is used in gunpowder and fertilizers. Appearance : Potassium Nitrate is available in a white crystalline form. Potassium is used in the manufacture of various types of Glass, Explosive-Blasting powder. Slurry, Dynamics, Matches, Fertilizers, Heat Treatment & Heat transfer salts and Leather processing Industries. Potassium nitrate is mainly used in fertilizer a s, as a source of nitrogen and potassium – two of the macro nutrients. Potassium nitrate is also one of the three components of black powder, along with powdered charcoal (substantially carbon) and sulfur, where it acts as an oxidizer. Potassium nitrate is an efficient oxidizer, which produces a lilac-colored flame upon burning due to the presence of potassium. It is therefore used in amateur rocket propellants and in several fireworks such as smoke bombs, made with a mixture of sucrose and potassium nitrate. It is also added to pre-rolled cigarettes to maintain an even burn of the tobacco. Potassium nitrate was used to ensure complete combustion of paper cartridges for cap and ball revolvers, as a treatment agent for the paper used to make the cartridges. Potassium nitrate can be found in some toothpaste s for sensitive teeth. Potassium nitrate successfully combats high blood pressure and was once used as a hypotensive. Potassium nitrate was once thought to induce impotence, and is still falsely rumored to be in institutional food (such as military fare) as an anaphrodisiac however, there is no scientific evidence for such properties. Potassium Nitrate contains not less than 99.0 percent and not more than 100.5 percent of KNO3. Identification: A solution of it responds to the tests for Potassium and for Nitrate. Chloride: A 500-mg portion of it shows no more chloride than corresponds to 0.21 mL of 0.020 N hydrochloric acid (0.03%). Sulfate: Dissolve 100 mg of Potassium Nitrate in 10 mL of water, add 15 mL of 6 N hydrochloric acid, and evaporate to dryness on a steam bath. To the residue so obtained add 7 mL of 6 N hydrochloric acid, and evaporate to dryness on a steam bath. Dissolve the residue so obtained in about 35 mL of water and, if necessary, neutralize with hydrochloric acid using litmus paper indicator. Filter, if necessary, to obtain a clear test solution. This test solution shows no more sulfate than corresponds to 0.10 mL of 0.020 N sulfuric acid (0.1%). Lead: A solution of 0.5 g of it in 20 mL of water contains not more than 5 4g of lead (corresponding to not more than 0.001% of Pb). Iron: not more than 0.001%. Limit of sodium: the limit is 0.1%. Limit of nitrite: To pass the test. Potassium nitrate contains not less than 99.0 per cent and not more than the equivalent of 101.0 per cent of KNO3, calculated with reference to the dried substance. 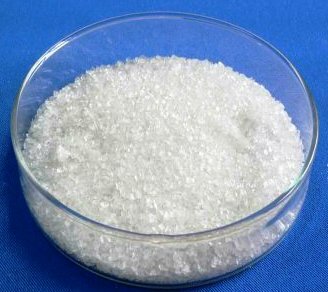 A white, crystalline powder or colourless crystals, freely soluble in water, very soluble in boiling water, practically insoluble in alcohol. A. It gives the reaction of nitrates. Loss on drying: Not more than 0.5 per cent determined on 1.000 g by drying in an oven at 100C to 105C. Potassium Nitrate occurs as colorless, transparent prisms, as white granules, or as a white, crystalline powder. It is slightly hygroscopic in moist air. One gram dissolves in 3 mL of water at 25°, in 0.5 mL of boiling water, and in about 620 mL of alcohol. Its solutions are neutral to litmus. Identification: A 1:10 aqueous solution gives positive tests for Potassium and Nitrate. Assay: Not less than 99.0% and not more than 100.5% of KNO3 after drying. Chlorate: Sprinkle about 100 mg of dry sample on 1 mL of sulfuric acid. The mixture does not turn yellow.